Digicel is the mobile market leader in the Republic of Haiti, with a ¾ share of the total number of subscribers. The operator provides good coverage for voice data transmission in the country. 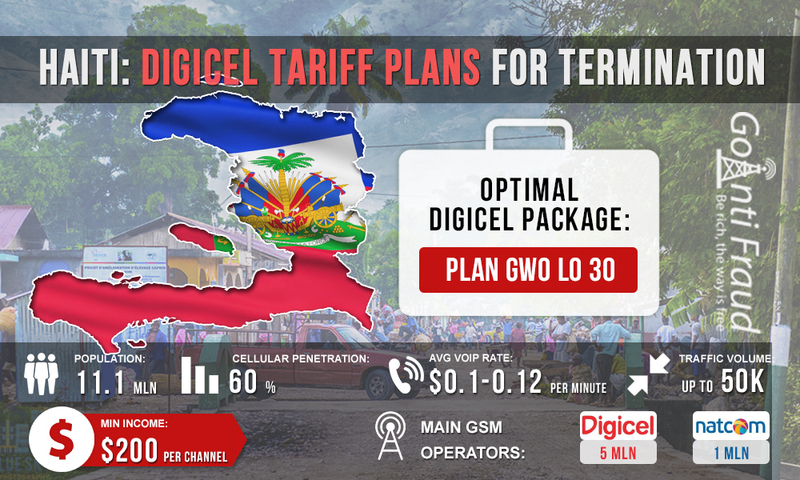 Large volumes of traffic pass through Digicel every day, so its starting plans will be an excellent solution for working in the field of VoIP GSM termination. One can get the Digicel SIM cards free of charge at the operator’s stores. However, this will require you to present an identity document or a copy thereof. Therefore, we recommend finding a dealer who sells starting plans in large amounts. By default, the cost of a minute of a call for prepaid clients is $0.05 (to the numbers of any operators). With an average rate of mobile voip haiti being $0.1 and higher, this is a low tariff as for cellular communication. PLAN GWO LO. This range includes 4 packages: PLAN GWO LO 30 (duration — 30 days, connection fee — $7.6, number of minutes within the network — 450); PLAN GWO LO 7 (duration — 7 days, connection fee — $1.95, number of minutes within the network — 105); PLAN GWO LO 1 (duration — 1 day, connection fee — $0.3, number of minutes within the network — 15); PLAN GWO LO 1EPL (duration — 1 day, connection fee — $0.1, number of minutes within the network — 4). PLANS MA LIFE. This range includes 3 packages: 9 HTG (duration — 24 hours, connection fee — $0.11, the subscriber gets $0.6 for calls within the network); 20 HTG (duration — 2 days, connection fee — $0.25, the subscriber gets $1.27 for calls within the network); 400 HTG (duration — 30 days, connection fee — $5, unlimited calls within the network from 5:00 am till 5:00 pm, 24 hours unlimited in the weekends). For traffic termination, choose PLAN GWO LO 30. With this plan, you will spend $0.01 per minute of a call. With the VoIP equipment running for 5 hours a day, the earnings of an entrepreneur will be about $400 (from one VoIP gateway port).